“Custom essay writing service online that fits your needs.” Something is off with that motto, right? Well, that describes my whole first impression about this website: something is off. The prices are rather expensive. You have the right to free revisions, but it’s limited to only 3 requests. This gives the company “flexibility” to change a sentence or two in your paper without paying real attention to your requirements. There’s a lot of bad SEO at this website, and that’s evident from the motto itself. I understand SEO; it’s absolutely necessary. When random keywords are inserted in illogical sentences, however, I cannot trust the writers of the service. There’s a Facebook page, which is not active at all. The Twitter page is a bit better, but there’s no community activity to show us that students trust this service. There’s no list of services at the website. When this happens, I usually find the list of services in the price chart. No list there. Finally, I hit the order form and there they are – the services available to order. You can order all papers, homework help, MA and PhD services, and admissions papers. There are decent guarantees, but not all of them have support in the terms and conditions. The prices start low, but there’s a crazy progression across the chart. There are three levels of quality: Undergraduate, Bachelor, and Professional. The deadlines start from 14 days and range up to 3 hours. The minimal price per page is $10, and that’s pretty affordable. However, the price for Professional level with a deadline of 3 hours is $56. The prices for admission help are unreasonable. They start from $41 per page for the longest deadline and range up to $197 per page for the deadline of 3 hours. The paper I got was not written according to my instructions. The writer wrote something entirely irrelevant. The limited number of revisions gives them a chance to ignore you once they do three minimal revisions. That’s exactly what happened. The writer refused to follow instructions although I insisted for specific aspects of the paper to be improved. After the third revision, I had no right to refund and additional revisions. When you want to access the live chat, you’ll get a pop-up that asks you for your name and email, as well as a choice of department. I contacted the support before I placed the order, since I needed assistance with the order form. I had to wait for an entire hour to get attended. Since then, the spam messages in my inbox wouldn’t stop coming. Not cool! You may request an abstract page for your paper, but that costs money ($14.99). A plagiarism report costs $9.99. The interesting thing in the order form is that the minimal price is set to $16.00 – that’s higher than the minimal quote the price chart lists. You may also get a top writer or your previous writer to work on your order. VIP service costs $14.99. 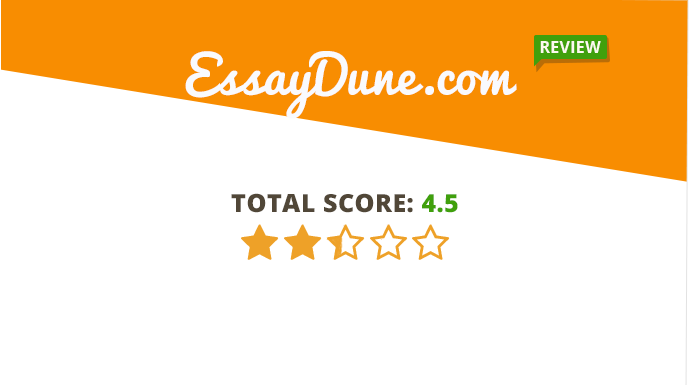 Overall, Essay Dune is not a service I’d hire again. It seemed nice at first, but the issues with the content were serious. The writer did not follow instructions and refused to provide proper revisions. The price was too expensive for quality of this level.